“LeBunny Bleu’s flats are the cutest shoes this year!" Let your flats do the talking. These Lina Pastel Flats are what will be at your side for this festive season! Currently at 20% off all regular-priced shoes, LeBunny Bleu shoes are now available! 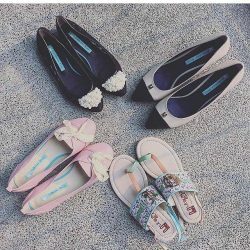 LeBunny Bleu brings you Buy 1 Get 2nd 50% Off Summer Slip-Ons! Don't miss out Before it's SOLD OUT! Want comfort and cuteness at the same time? Enjoy 30% OFF Craion Sneakers from LeBunny Bleu!